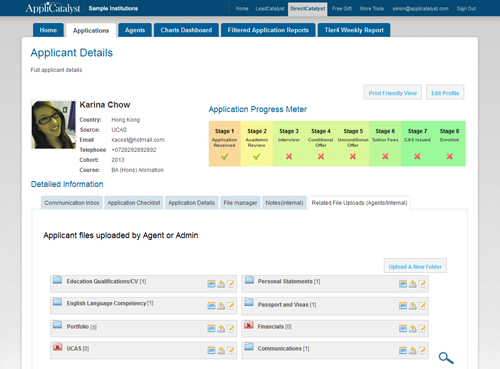 "AppliCatalyst manages every aspect of my local and international student recruitment process from discovery to enrolment, all in one place"
Student Recruitment Customer Relationship Management (CRM) - By providing tools to capture enquirer and applicant details at each stage of their journey, and to communicate targeted, relevant and timely information to them aimed at increasing the conversion from each stage to the next. 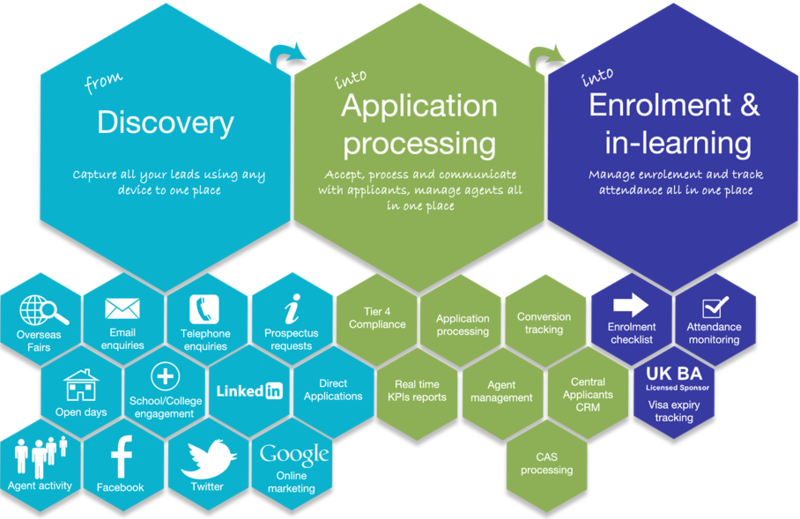 Workflow Management - by providing tools to help institutions create and manage automated workflows that take into consideration the source of the enquiry, level of study, cohort, responses or changes in an offer/decision resulting in improved enquiry handling and efficient channelling of application queries to relevant internal contacts & departments. Communication - By providing integrated tools for effective campaign execution (through appropriate media such as email, sms, print and voice) connected to a central data capture hub for keeping all records of communication under an applicant's individual profile, not in staff inboxes. International Students & Tier 4 Compliance - by enabling institutions to create custom workflows that cater for international applicants making sure their applications follow the outlined UKBA checkpoints required to stay compliant. 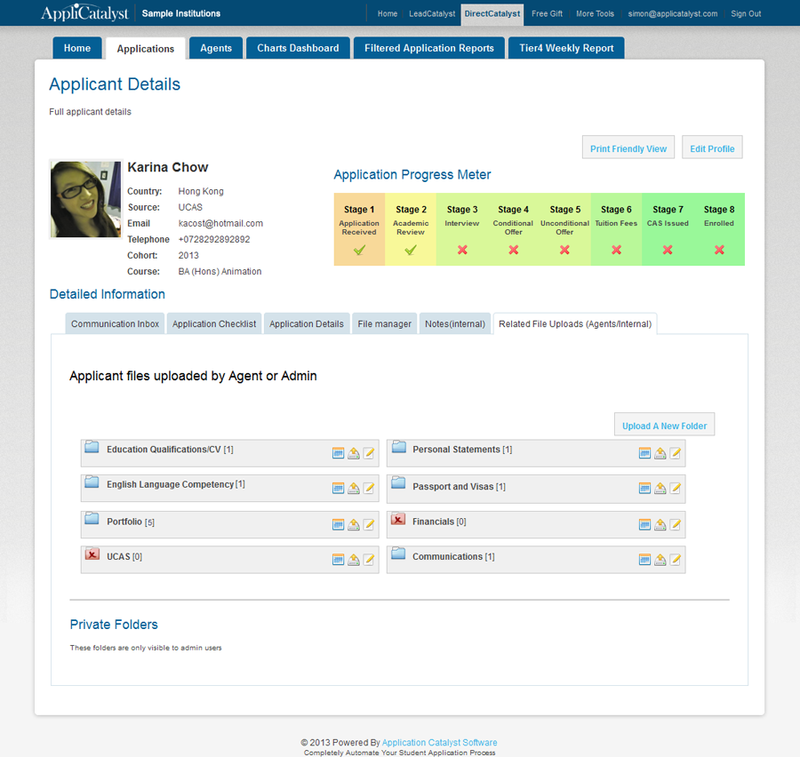 AppliCatalyst also houses an attendance management system for post enrolment. Key Stakeholder Relationship management - via a secure portal for approved Agents/Teachers/Feeder Schools to support, communicate directly & submit their applicant's information providing a real-time view of applicant numbers as well as activity monitoring tools. Recruitment Targets Monitoring - by providing real-time conversion monitoring tools that enable quick identification of struggling subject groups. Import/Export Of Application Data - by providing tools that enable the importation of application data from sources such as UCAS or any other application management software. Quick setup, all we need are a few details.